Directed by Sam Peckinpah and written by Peckinpah, William Roberts, and N.B. Stone Jr., Ride the High Country is the story of two aging gunslingers who are tasked to transport gold from a remote mining town as they deal with new rules in the American West. The film is an exploration of two men who take a job with a young man as they try to maintain a sense of honor in the West. Starring Randolph Scott, Joel McCrea, Mariette Hartley, Warren Oates, Ron Starr, Edgar Buchanan, and James Drury. Ride the High Country is a rich and exhilarating film from Sam Peckinpah. Set in the early 20th Century in the age of automobiles and sideshows, the film revolves a former lawman who asks an old friend to aid him in transporting gold for a bank by going to a remote mining town. With the aid of a young cowboy, the two men go on a two-day trip into the mountains where they would later be joined by a young woman who is going to the same town to be married. It plays into two men trying to do something with what could be the final moments of their lives as well as find some meaning in a world where honor and duty seems to fall by the wayside in favor of a world that is changing. The film’s screenplay that is written by N.B. Stone Jr., with un-credited re-writes by Sam Peckinpah and William Roberts, play into two men who were friends as they served in both sides of the law where money is now what they need. For the lawman Steve Judd (Joel McCrea), he is asked by a bank to do a job after six miners were killed but Judd couldn’t do the job alone as he runs into his old friend Gil Westrum (Randolph Scott) who works as sideshow artist as he used to be a great sharpshooter. Westrum brings in a young cowboy named Heck Longtree (Ron Starr) to aid them as Longtree is a young man that has a lot to learn as he has won races and is good with a gun but is also very immature. Notably as he tries to pursue a young woman he would encounter in Elsa Knudsen (Mariette Hartley) during a stop at a barn that is run by Elsa’s father Joshua (R.G. Armstrong). That all happens in its first act where the second act is about the journey to this remote mining town where Elsa’s fiancée Billy Hammond (James Drury) lives as they would marry. Yet, Heck is uneasy about Hammond and his brothers where it would lead to a conflict that would finally come ahead in its third act. Especially as the Hammonds represent everything Judd and Westrum are uneasy with as they try to keep things to themselves. Unfortunately, ideals of what Judd and Westrum are about would come to ahead for each other as Judd is very stubborn about doing the job so he can get a measly reward. Westrum realize the worth of the gold would conspire with Heck about taking the gold which does lead into this conflict until the Hammonds get involved where it’s not about gold but rather about what is what and who does it belong to. The sense of honor and disdain for modern times is evident in the script as there is also some strong dialogue that plays into this old world vs. new world mentality that would eventually collide in its climax. Peckinpah’s direction is quite simple in terms of the compositions he creates yet he infuses the film with a lot of wide shots to capture the landscape as it is shot on location in Inyo National Forest, Bronson Canyon, and other locations in California. Peckinpah opens with the film with Judd riding into town thinking he is getting some kind of heroic welcome when there’s a horse race happening as he has to contend with cars and new rules. It plays into that sense of the modern world where old men are treated with a lack of respect as Judd would find Westrum in costume that shows Westrum’s own sense of desperation for money. Peckinpah doesn’t really go for a lot of stylish shots with the exception of a wedding reception involving Elsa and Billy Hammond that plays into the craziness that Elsa is embarking on. Yet, Peckinpah plays into something that is more of an ode to the Westerns of the past as he brings this sense of conflict on a visual scale to play into what was happening in the modern world. 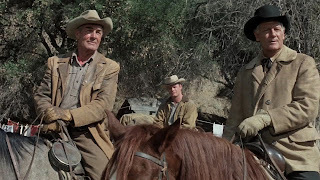 The direction doesn’t include a lot of gunplay until its third act as Peckinpah is more concerned about the journey and what Judd and Westrum would encounter such as Elsa’s very religious father where they sort of agree with his stance on the world but are fully aware that not everything he says is right. There is a bit of tension that goes on but Peckinpah keeps it very restrained as he just lets things play out slowly until its third act where Heck’s suspicions about Billy Hammond not only come true but realizes what he has to do. Peckinpah’s usage of close-ups are low-key as it does play into the tension that goes which includes Judd and Westrum’s own complicated relationship where they don’t trust each other but they would rather stick together than trust someone else. Most notably as they have to deal with forces who don’t play into this code of honor and duty but rather for their own selfish reasons which forces Judd and Westrum to do what they must do. Overall, Peckinpah creates a very captivating yet thrilling film about two old gunslingers trying to transport gold for a bank and cope with the new world around them. Cinematographer Lucien Ballard does brilliant work with the film‘s cinematography with its lush and colorful look of the exteriors including some of the interior and exterior scenes set at night as it plays into the beauty of the American West. Editor Frank Santillo does excellent work with the editing as it is very straightforward with the exception of a few rhythmic shots for the scenes set at the wedding ceremony. Art directors Leroy Coleman and George W. Davis, with Henry Grace and Otto Siegel, do fantastic work with the look of the Knudsen family farm and house as well as the camp where the Hammonds live in. Sound recordist Franklin Milton does nice work with the sound to play into the atmosphere of the locations as well as some of the action that occurs in the film. The film’s music by George Bassman is superb for its orchestral-based score that features elements of country-folk music to play into the tone of the West as it ranges from being playful to being very serious in some of the scenes with its bombastic orchestral themes. The film’s amazing cast includes some notable small roles from Carmen Phillips as a saloon girl Heck flirts with early in the film, Percy Helton and Bryan Foulger as a couple of brothers who have issues with Heck over a race he won early in the film, and Jenie Jackson as the saloon owner Kate who is a woman that is clearly larger than life. Other noteworthy small roles include Eugene Buchanan as a judge in the mining town as he has a superb moment in officiating the wedding while John Anderson and John Davis Chandler are terrific in their respective roles as Elder and Jimmy Hammond who are just as crazed as their brothers. Warren Oates and L.Q. Jones are excellent in their respective roles as Henry and Sylvus Hammond as they both have a sense of craziness and dark humor to their performances. James Drury is wonderful as Billy Hammond as the lead brother who is to marry Elsa where it turns out that he is exactly what Heck suspects him to be. R.G. Armstrong is superb as Elsa’s father Joshua as a religious man who tries to protect Elsa as he believes that there are no men worthy of her. Ron Starr is brilliant as Heck Longtree as a young cowboy who is a friend of Westrum who tries to get things his way and flirt with Elsa only to realize the way things are as he would eventually gain Judd’s trust. Mariette Hartley is fantastic as Elsa Knudsen as this farmer’s daughter who is initially excited by the presence of men where she later accompanies them on her way to getting married as she later copes with the realities of marriage and what a woman really needs in a man. Finally, there’s the duo of Joel McCrea and Randolph Scott in incredible performances in their respective roles as Steve Judd and Gil Westrum. McCrea brings a low-key approach to his role as Judd as someone that is trying to maintain some sense of honor while being stubborn in doing what is right though he’s getting paid more than Gil. Scott brings a more livelier approach to the character of Westrum as well as a sense of conflict into helping his friend or take advantage of what he is transporting. McCrea and Scott definitely have great rapport together as it is clear that they know what their characters are as well as the sense of duty and honor they’re trying to hold on to. Ride the High Country is a phenomenal film from Sam Peckinpah that features great performances from Joel McCrea and Randolph Scott. With an amazing cast, beautiful cinematography, and a compelling theme on old men adapting to a new world. It’s a film that is enchanting in its study of duty and honor as well as coping with a world where the rules have changed. In the end, Ride the High Country is a spectacular film from Sam Peckinpah.